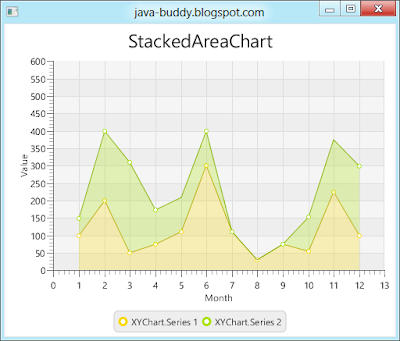 JavaFX 2.1 introduce a new StackedAreaChart class. StackedAreaChart is a variation of AreaChart that displays trends of the contribution of each value. (over time e.g.) The areas are stacked so that each series adjoins but does not overlap the preceding series. This contrasts with the Area chart where each series overlays the preceding series. The cumulative nature of the StackedAreaChart gives an idea of the total Y data value at any given point along the X axis. Since data points across multiple series may not be common, StackedAreaChart interpolates values along the line joining the data points whenever necessary. In the example, some column in series 2 are missed. 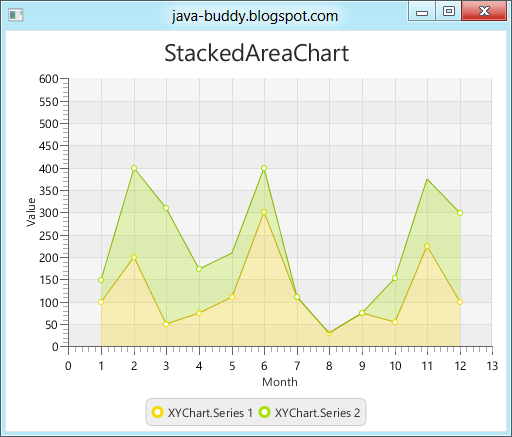 From the graph, it can be noticed how JavaFX display the StackedAreaChart with missed column.